A few years back, a phenomenon known as "Popcorn Lung" began making headlines. A flavoring chemical called diacetyl (used to simulate the taste of butter) was causing workers who manufacture microwave popcorn and butter flavorings to get a rare and serious disease called bronchiolitis obliterans (as in, "your lungs have been obliterated"). 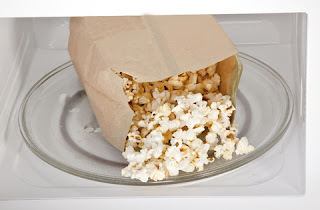 In one case, a two-bags-a-day microwave popcorn consumer also contracted popcorn lung. 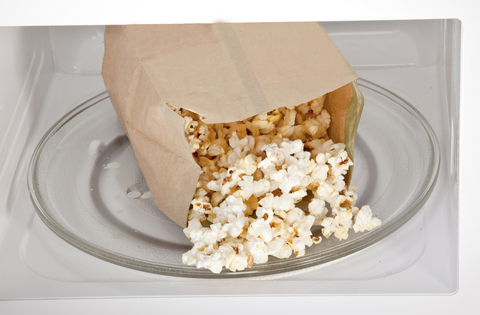 In response to the bad press, many manufacturers began removing diacetyl from microwave popcorn. Now, a new (but strangely familiar) threat has surfaced. PFOA (or perflourooctanoic acid) is a known carcinogen that is used in the manufacture of Teflon and other non-stick cookware. As it turns out, it is also used in fast food wrappers, paper plates, and microwave popcorn bags. This cancer-causing chemical used in food packaging appears to be making its way into the food itself. In addition to causing cancer, there's mounting evidence that PFOA and other PFC's (perflourinated compounds) may be leading to fertility problems. Wondering what to do about it? You can start by making your popcorn in a good old fashioned dutch oven. It's healthier, free of synthetic chemicals, and tastes a whole lot better. I have recipes for making popcorn in an enameled dutch oven as well as in a regular dutch oven, and just posted a video recipe for dutch oven popcorn to help people who are new to dutch oven popcorn-making. Go ahead... take charge of your family's health today. And don't forget to stop by the blog and leave a comment if you have any questions. Thanks! Nice write up. I started using my dutch oven to make popcorn last year. Not only is it healthier, it taste much better! I will never eat microwave popcorn again! I use my dutch oven now, thanks to you, and mine even has the three legs. It still works perfectly for popcorn and I've never burned a batch. So yummy! Thank you! So glad you've forsaken microwave popcorn. Nothin' there but trouble. I'm impressed that you're using your camp dutch oven for stove-top popcorn. Way to go!